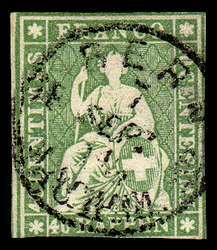 Scott #40, 1858 40r dark yellow green Helvetia. Used Fine. Looks very nice. 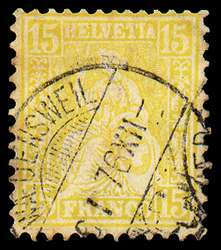 Scott #54, 1867 15c lemon Helvetia. Used F-VF. 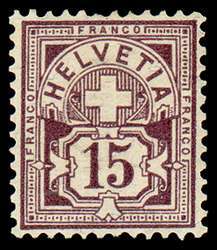 Scott #59, 1867 50c violet Helvetia. Used F-VF. 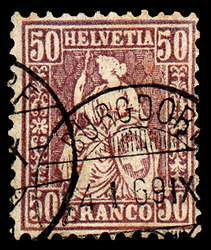 Scott #59, 1867 50c violet Helvetia. Used VF, with full cancel. 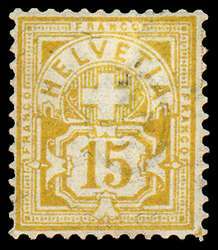 Scott #75, 1882 15c yellow Numeral. Mint F-VF, slight defects. Scott 2006 value $140. 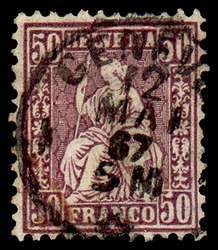 Scott #76, 1889 15c violet Numeral. Mint VF.